Makes baking, canning and drying a breeze! Peels, cores and slices in one easy action. This made my abundant apple supply easy to can and freeze. I was surprised that the size of the apple did not matter a whole lot. This is amazing! After using this just once I am kicking myself for ever having hand peeled apples through canning season. It took me two hours to peel and slice all the apples to fill my dehydrator last week. After using this today - 20 minutes!! LOVE LOVE LOVE how well this worked! The apple peeler arrived the day before I made my second batch of applesauce. Worked great! Made a big difference in the amount of applesauce I canned in comparison to the first batch peeled by hand. A lot faster as well. I'm really happy with my purchase. I bought this for my sister in law, My son's girlfriend had bought me one and I love it. So I took mine to to sister in laws and helped her do apples, We were done in no time and we doubled her amount she would have canned. So I bought her one as a gift so she can enjoy it all year long too. LOVE LOVE LOVE IT!!! This peeler is worth every penny!!! I love to bake pie and apple dumplings, and this makes it much easier. It peels, cores, and slices all at once! I've had this peeler for three years and it still works great. It's easy to clean and the suction cup actually works. This is a must-buy if you are a baking enthusiast! LOVE IT! I was skeptical that a suction cup would actually work, but it does great on our laminate counter top. It is quick and easy to operate. We wash and place the apple on the prong, and our young kids like to crank the handle. We thought that we would use it more for pies, etc, but they like it so much and it is so quick and easy to use that we use it almost daily. Glad we tried it! I had to purchase a new apple peeler because I wore out my previous one. This one works great! I like that I can do my apples on the kitchen counter now, instead of having to hook it to my kitchen table. I bought this last year during apple season when it was on sale. It took months to arrive - and when it did apple season was over. I opened it today to use, because it is again apple season, and there are no instructions. (I actually knew that because I opened it AND e-mailed Lehman's when I finally received it and got no reply) but I figured I could puzzle it out. Yeah, needs instructions. I'm not really impressed with the peeler OR Lehman's customer service with this one. My husband bought this for me when we first bought property that had apple trees on it. More than a decade later, I still LOVE this gadget. I can process a lot of apples in a very short time, which makes harvest season even more of a joy! I especially am noticing the difference this year, when I was given two bags of pears from a neighbor, and I was able to do six bags of apples faster than the two bags of pears! Husbands, kids, and people who don't like to cook also seem to enjoy using this gadget, so it's fun when you want to get a little help, too! I LOVE THIS APPLE EXPRESS SUCTION CUP PEELER. I HAVE THE ONE YOU SCREW ON TO THE COUNTER WHICH IS FINE IF YOU CAN DO IT OUT SIDE ON A WORK BENCH. BUT I AM HANDICAPPED AND MY COUNTERS ARE TO WIDE TO FIT THE CLAMP ONTO. IT IS NOT WIDE ENOUGH AT THE (DEEP PART) WHERE IT GOES OVER THE COUNTER. THIS ONE I HAVE WORE IT OUT. I HAVE ORDERED 6 THIS PAST YEAR AND LOVE IT WHEN THEY DO A SALE... I GAVE IT TO THE FAMILY THIS CHRISTMAS WHO DO APPLE PIES LIKE WE DO. 10 POUNDS OF APPLES IN 30 MINUTES... USE IT WITH THE SLICER AND I USE IT WITH IT DOWN SO I CAN DO WIDER SLICES. I HAVE USED IT WITH ALL VEGETABLES TRY IT ON POTATOES JUST THINNER PEELING. TOLD YOU LOVE IT....I AM ABLE TO SAY LET PEAL FRUIT AND SMILE WHILE DOING IT. I got this for the wife and she loves it. I love this apple peeler and slicer! It is easy and fast to use. I have ordered two for gifts!! Easy to use and such a time saver with toddlers! I ordered this apple peeler, and I love it!!! It is so easy to use on apples and potatoes. I have arthritis in my right hand, so this product really helps me in the peeling process of apples and potatoes! Ordered one for my friend, and plan on ordering more for Christmas presents. Thanks for this wonderful product! Worked wonderfully the first time I tried it out of the box. Sturdy and peels/cores great! I LOVE this device! I make apple pies and home made applesauce and this makes both of those tasks a breeze. My mom ended up with one of these, too, and she was amazed that I set it up and had 5 lb. of apples in the pot for sauce in under 5 minutes. I recommend this to anyone who cooks or bakes with apples...ever! Just got it and we love it. My kids are eating more apples because not only are they easier to fix now, but they enjoy watching and participating in the peeling/slicing/coring. My husband thought I'd ordered another gadget, but he's impressed and loves it too! This peeler is awesome! I can't believe I've spent so much time peeling apples without it. Easy to use, adjusts well even to food that is not perfectly symmetrical. We ran a batch of potatoes through it and made wonderful curly fries. Would recommend this to everyone! LOVE, LOVE, LOVE this peeler. It's amazingly fast. Our son thought it was so cool. He told his wife that if they had one, apples would be a big part in his diet. I feel a Christmas gift purchase coming on. Thanks Lehman's for making a healthier lifestyle possible and so much easier. My mother-in-law bought me one of these this fall. What a breeze to core, peel and slice apples! Even my 2 yr-old can do it (if I put the apple on the rod). My parents and 2 uncles were so impressed with the product when I showed them mine, I ordered them each one. A great deal! Thanks! 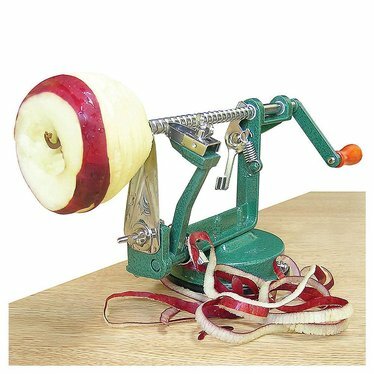 I will not live without an apple peeler,core,slicer again! !It is Amazing how fast,and easy my work with apples has become.Thank-You Lehmans!! Great product, my children were very impressed so ordered as a gift for them.